View More In Rack Accessories. 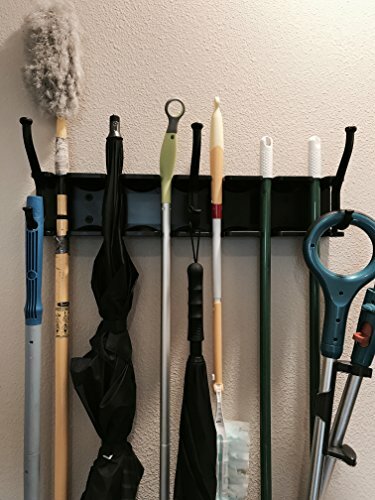 Multi-Purpose expandable wall mount organizer/rack for your home, laundry, mud room or garage. Multi-Purpose Expandable Home Wall-Mount Organizer/Rack. Designed to hold/hang 6-13 items including brooms,dusters, vacuum attachments, umbrellas, sports equipment and much more. This product is built to last. Made of the highest quality ABS plastic, Designed to firmly fasten to the wall and last the most extreme conditions. Measures: 23-1/2" x 4-1/2" x 3.25", Comes complete with hardware. Made in the USA. If you have any questions about this product by Evolution Performance Sports, LLC, contact us by completing and submitting the form below. If you are looking for a specif part number, please include it with your message. Winco VEXS-1848 4-Tier Wire Shelving Set, Epoxy Coated, 18" X 48" X 72"